The Australian version of the Outlander PHEV does not come with the fast charge socket on the outside nor the 240V 6A socket in the back luggage area. I believe the slow charge socket is INPUT only. The "Mitsubishi-brand" charger draws 10A and is fitted with a 15A plug! I was hoping to use the surplus power stored in the car to power my house and possibly feed into the grid to supplement my PV system during daylight hours. I would then charge the car "off-peak" after midnight. Is a "control box" available that could control the power feeding the house/grid? It would need to include a current output limiter, a timer and an automatic disconnect function in case the grid goes down. I guess I would have to manually monitor the car battery so it doesn't fully discharge. If such a device is available I can then approach Mitsubishi to see if they would fit the inverter and 240V output socket. I have calculated using the car battery in this way will save me over $1200 per year. Is this at all possible or am I just dreaming? Merridy wrote: Is this at all possible or am I just dreaming? There are lots of hurdles to jump through the car makers are not going to do it ATM. Australian electricity distributors are also far from ready to even consider this, there limiting export there not about to allow a bunch batteries to export ATM. Merridy wrote: If such a device is available I can then approach Mitsubishi to see if they would fit the inverter and 240V output socket. ? There would be NO WAY, not ever, that a car manufacturer would include an inverter, other than "Perhaps" for camping..
Two reasons - Firstly the serious chance of someone kills themselves, via something THEY fitted. Secondly - how would they guarantee the battery system, when you might abuse the battery by over-discharging..
Then, as identified already - Battery/Grid=Feed is strictly verboten..
but from a practical viewpoint, YOU could fit a serious socket and feed an external inverter..
What battery voltage do they use in an EV..??? Tracker wrote: What battery voltage do they use in an EV..??? Normally in the range of hundreds of volts, I've seen 360dcv + mind you that means there at about standard grid voltage peak, so typically lots of smaller cells all run in series, makes it easy to install them in funny places too.. reduces the size of the charger, improves charge efficiency, etc. Thanks David - I have never had cause to even think about what voltage they used..
DEFINITELY not a voltage that one should be playing with, feeding to an external DIY system.. The 240V 6A socket is available on European and Japanese Outlanders. (No need to worry about battery DC voltage as this socket is AC.) They can just plug-in their camping equipment, iPad, car fridge, etc. I just want to plug-in my house! Merridy wrote: The 240V 6A socket is available on European and Japanese Outlanders. I would suggest it was not approved in Australia, we have some interesting rules in the ADR's combined with electrical and it may have been too much hassle, easier to just leave it out. I think you will find that the battery in any EV is better serving the car than any regular use powering external devices or feeding to the grid. For example my Mitsubishi Imiev can travel 100km on 10 Kwh of energy. At say 25 cents Kwh $2.50 . Lets say your car standard ICE car or even outlander in ICE mode consumed 7lt 100km at $1.50lt so $10.50 . You can see than your $2.50 (10kwh) of electricity is much better served powering your car than your house or feeding to the grid no matter what your feed in tariff is. The batteries in mitsubishi's EV's are 360v when fully charged. In japan Mitsubishi do offer a 1500w inverter that plugs directly into the I Miev DC fast charging port giving the inverter direct access to 16kwh -360v DC battery. 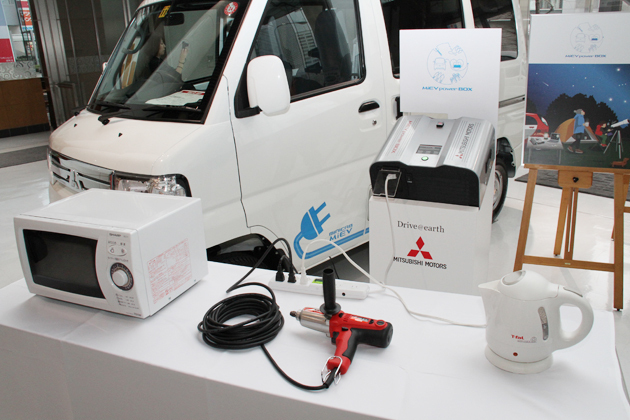 Mitsubishi dealers in Japan will start selling a 1500W AC inverter that is powered by the car's battery via the L3 Chademo socket. Priced at a rather high $1815 USD including taxes, hopefully with a clean true sine-wave output. 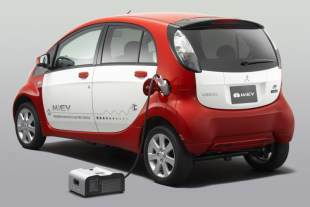 Mitsubishi announced that it will bring to market on April 27 the new MiEV power BOX power feeder which is capable of supplying large amounts of electrical power from an electric vehicle (EV). 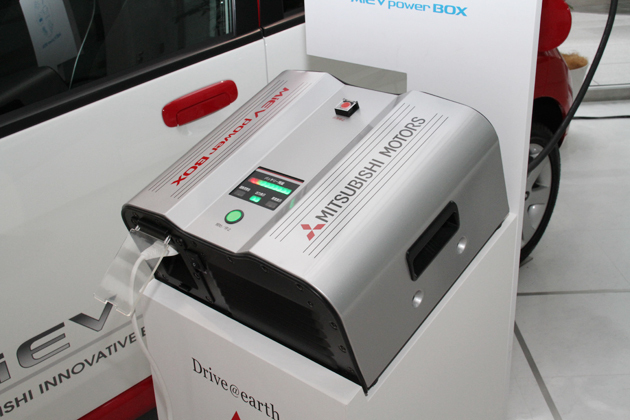 Supplied by a Mitsubishi Group affiliate, the MiEV power BOX will be offered as a dealer option for the company's i-MiEV and MINICAB-MiEV EVs and will carry a manufacturer's recommended tax-inclusive price of $1,815 USD. The MiEV power BOX is an adapter that plugs into the i-MiEV or MINICAB-MiEV's quick charging connector and is capable of supplying up to 1500 watts of AC electricity from the power stored in the vehicle's drive battery. It has been designed mainly to power household electrical appliances either when away from home or in an emergency. When connected to a fully-charged 16.0 kWh battery-equipped model the MiEV power BOX can supply 1500 watts of power for between five and six hours, equivalent to the amount consumed by an average Japanese household in a single day." Secondly - how would they guarantee the battery system, when you might abuse the battery by over-discharging. You can't over discharge the battery with any device that connects to the factory ports. The BMS would pull the pin way before that happened. Though like I mentioned above there isn't much point in a inverter perhap other than powering a few corded devices when out and about or emergency situations. though if there was a emergency the range stored in your car might be more useful than the kwh's to power 240v devices. Placing extra regular cycles on your expensive OEM traction pack would most likely be a false saving. You can see in this short video they show it powering a small kids street party. The outlander EV in AU doesn't have the direct fast charge DC socket. I plan to charge the car every night at off-peak rates. Cost for 10kWh = $2.30. If I don't use the car the next day I could feed this into the house and save peak charges. 10kWh peak = $3.60. Saving = $1.30 per day. Even better would be to feed it into the grid during daylight hours. (My solar panels don't feed-in much over winter!) 10kWh feed-in = $6.80. Net income = $4.50 per day. Can I get some sort of control box that limits the current output from the AC socket on the car? The J1772 socket on the side of your car is just a input socket to the onboard charger. You're not going to be able to extract any energy out of the car. Forget about powering your house of feeding the grid from your EV. The $10,000 battery in your EV and its limited cycle life is much better of being used to turn the wheels of your car and save you burning petrol than saving your a few cents on your power bill. Any device you could have custom made to some how tap into your car's traction pack would require a custom built inverter and interface electronics that could speak to the car and allow it to happen. A one off design of somthing like this would most likely cost several times more than the purchase price of the car. A much better choice would be to purchase a dedicated Solar Hybrid - On Grid Inverter with Battery Backup. Something like the selectronics SP pro. I think you will find that the contract you have for your feed in tariff is locked into your PV system. This generous feed in tariff was introduced to encourage people to install PV systems and not designed so people could take advantage of it in other ways. There is no (current output ) AC socket on the car. Or were you asking if there is a way to limit how fast the car charges (how much current it draws from the wall socket)? If so then yes the EVSE basicaly the charging cord that plugs into the car has a box inline with the cord. Inside this box is some electronics that speak to the cars onboard charger and tell it what charge current to consume. The factory EVSE has been programed in AU to consume just under 10A - about 2200w. Even though the onboard charger can charge up to 3300w. You can purchase aftermarket EVSE cords that have selectable charge rates 6 - 13A roughly ( 1400w - 3200w) in 1 amp increments. So you could set it to charge at say 7 amps or whatever you like.